Posted 10:35 am by Heather Iannucci & filed under Object of the Week. 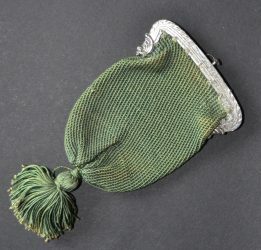 This green silk coin purse engraved with “Miss Jay” on the silver frame, belonged to either Nancy or Sarah Louisa Jay, John Jay’s two younger daughters. Coin purses constructed with rigid frames came into popularity in the early 19th century. Often the metal frames were purchased, and the fabric bags were knitted by young women and sewn onto the frame. Objects such as this tell a story about the Jay Women – the subject of our thematic tours offered Thursday through Saturday at 2pm during the month of March.